My cats prefer pond water to tap water (pond water has more bouquet, I guess) and several neighbourhood cats congregate to drink, watch fish and sing together in chorus. It is a bit like a British pub and gives a whole new meaning to the term “local watering hole”. 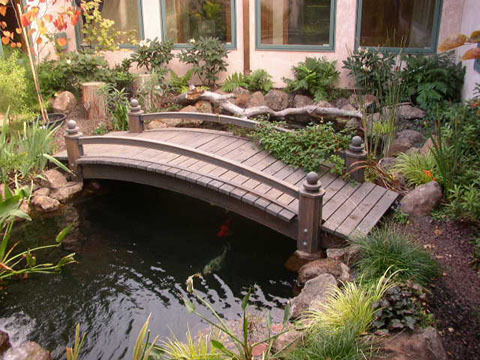 A water garden or garden pond is a decorative and entertaining addition to your garden, but also quite some work as ponds require regular maintenance. Mother Nature may take care of her own lakes and streams, but a human-built water garden requires frequent human intervention. This means that you, the gardener, must keep the water clean and free of bad chemicals, the plants pruned and in bounds, the fish fed (but not overfed) and the water level consistent. Let us take these tasks in order. First the water quality: Pond water will not be crystal clear and that is OK. Some algae is normal and good for your fish. You cannot really improve your water quality by adding fresh city tap water. 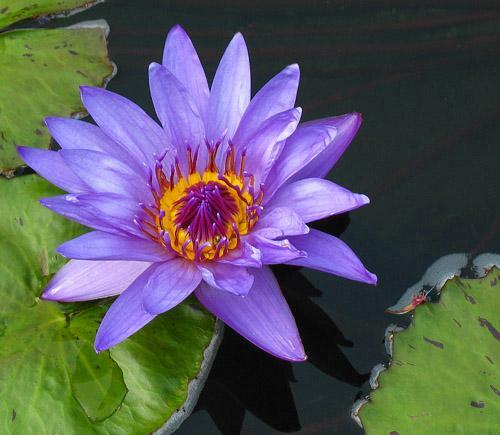 Instead, work with the water in your pond and avoid doing complete water changes if you can. 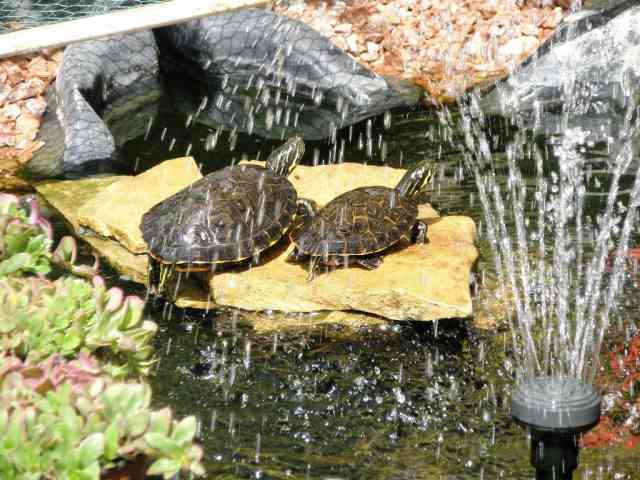 The chlorines and chloramines of our potable water system can harm your fish if their levels get too high.garden pond Likewise, the chemicals leaching from new concrete and lawn products can wreak havoc with your plants and fish. Get a test kit and use it to make sure that your water has proper pH, does not show high levels of ammonia (decay byproduct) or chlorine. Clean up the organic matter that drifts into your pond and prune away the decaying tops of plants that have finished their life cycle. You can put nets over the pond to catch leaves that drift into your water garden. Overhanging trees may look romantic but they can be a real headache as they drop leaves into the water. Skim the leaves regularly so they do not sink to the bottom and make sludge. A biological filter system is your best route to healthy water. When connected to a re-circulating pump, it can clear a lot of the bad things from your pond. Size is critical – the larger the better in most cases. The action of a bio-filter takes place on the surfaces exposed to bacteria. Pieces of lava rock are frequently recommended as filter box filler. There are plastic foams and polyfiber filter materials also available. And, most important, there are bacterial inoculants you can buy to add nitrifying bacteria to the water. 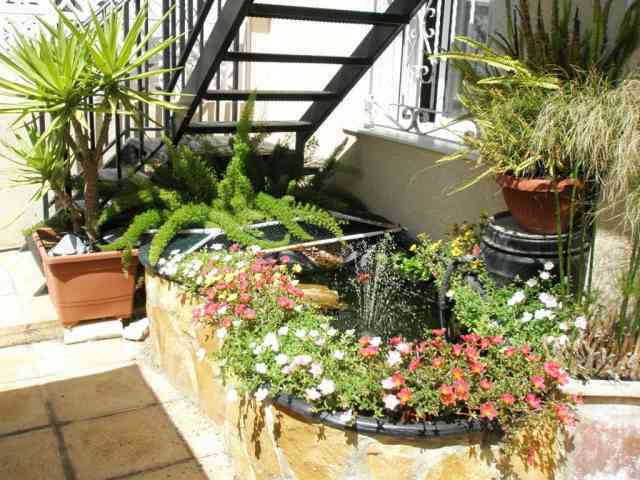 I have here in Spain a small, raised pond and every year I need to clean it thoroughly. This is a tedious process. The fish and terrapins must be caught and transferred to a large bowl full of pond water, the pots of plants removed, the water drained (it makes great irrigation water for the garden) the sludge from the bottom removed, and the sides of the pond scrubbed clean. No soap or detergent should be used. Elbow grease is what is required. Then, after rinsing, when the pond is refilled, I will have to start the balancing act all over again… What I really need are more water plants to cover the surface, but my terrapins eat them. Once you have a water garden, you will soon discover that what you chose to put in are not its only inhabitants. A myriad variety of creatures, from microscopic to very large, inhabit this garden, too. Some you will want and others you will want to get rid of. Among the unwanted insects, mosquitoes lay eggs in the water to hatch into little wigglers. My low-tech solution is to keep water running along the sides of the pond and goldfish and terrapins in the pond to eat the larvae. But I love to watch the large, colourful dragonflies that come to my pond. The bees, the butterflies and the birds like the water, too. I have made certain to have rocks and gravel raised above the deeper water, staying moist so the insects and birds can drink without drowning and the terrapins can bask in the sun. However, this area would also make a perfect fishing spot for cats, so part of it I have covered with netting to keep the cats out. It works, but they love to lie on top of the net watching the fish and to drink from the side of the pond. The rocks are placed on top of a large upside-down plastic flower pot with a large arched “door” cut on the side. This provides the fish and terrapins with a nice shady hiding place.garden pond bridge. Along with fish you can add snails. I have done this several times, but they lasted less than a week. Beside plants, my terrapins apparently adore escargot as well! I also have a small frog that was lucky enough to survive being caught by one of my cats. Now I never need to check the weather forecast for rain – as soon as the frog starts croaking happily, I know rain is on its way. My cats prefer pond water to tap water (pond water has more bouquet, I guess) and several neighbourhood cats congregate to drink, watch fish and sing together in chorus. Garden kraft Benross Solar Powered Meerket Light Ornament. The Benross Group, provider of quality items for your home and garden. A fun and functional gift that will look great in any garden. 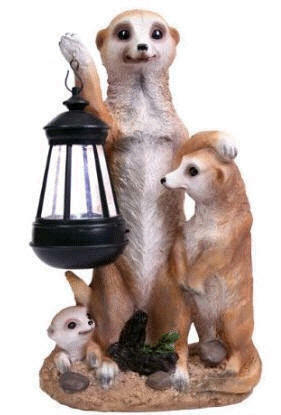 A fun meerkat family holding a lantern containg a solar powered bright white LED light that will light up your garden. An auto sensor means the light will come on automatically when it gets dark. No wiring means you can place the meerkat anywhere in your garden easily. Please search for more great items from the Benross Group on Amazon.co.uk including an extensive range of Christmas, Garden, Solar Lights, Tools, Toys and Gizmos, Camping and much more. Gardening in Spain The Spanish Pond spanish ponds.